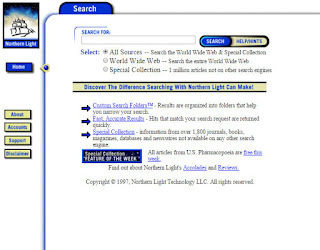 The Northern Light web search introduced in 1997 worked until 2002. The search engine offered several new ideas: For example, it had a category search (a very new idea at the time) based on keywords, sources and so on. Librarians created the search interface in a two-year project. Second, they combined a web search with a kind of deep web search. In addition to the web results, users receive full-text journal articles on a pay-as-you-go basis. Today, "Northern Light" works as a news search. 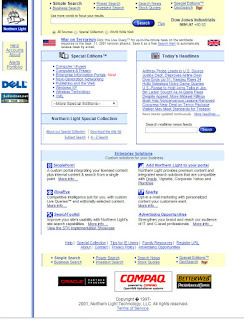 »On August 12, 1997, Northern Light Technology introduced its Northern Light Search (http://www.nlsearch.com or http://www.northernlight.com), a refreshing new direction for Internet search engines. The Northern Light search engine made two significant steps forward. First, the Northern Light database searches both Web pages and full-text articles. Secondly, Northern Light sorts its search results into folders based on keywords, source, and other criteria.